A lovely baby pink knitted shawl blanket is the ideal gift for a new baby and when personalised makes a wonderful Christening blanket! 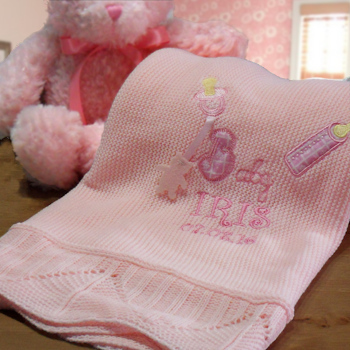 Pretty baby pink colour with a pink colour scallop edging this knitted acrylic shawl also features an adorable Baby applique assortment of motifs to one corner. The blanket measures 105 x 96cms.